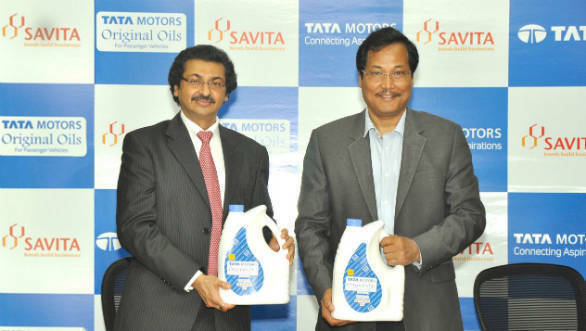 Savita Oil Technologies and Tata Motors have signed agreement through which the former will manufacture and supply original oils under the the Tata Motors Original Oils brand name to the Indian manufacturer's passenger car division. Through this partneship, Tata Motors hopes to deliver original products at a competitive price and will ensure easy availability through the bazaar channel, essential to building and maintaining in the Tata brand. These products will be supplied by the authorised parts distributors of Tata Motors for the after-market or replacement market segments The new range of engine oils will complement the existing original parts business for Tata Motor's channel partners. class service, spares and consumables for all the after-sales needs of their customers. This announcement will ensure easy availability of recommended engine oils for their buyers, for the long-term health and maintenance of their vehicles. Customers will also receive a quality product which will in turn help them extract the best performance out of their engines." Mr. Gautam N. Mehra, Managing Director of Savita Oil Technologies Limited said this partnership reaffirms the very high quality standards that the company adheres to across product lines. This also bears testimony to their commitment to quality, technological advancement and heightened customer engagement, thus co-creating right value for all stakeholders.